Our aim is to make building compliance simpler, faster, transparent using Autodesk BIM360 Cloud software with online submission of 3D plans, Automated rule checking, Online viewing of 3D Plans, Online communication thereby making it a win-win proposition for all the stakeholders i.e Owners Architects, Town Planners, Municipalities. Majority of building plans submitted are not code compliant resulting in high review costs, wastage of time and loss of revenue. IBIM-APR will ensure error free Building Plans are submitted by Architects so that Owners can start their building construction at the earliest. Building Codes such as Setbacks, Heights, Permitted Floor Space Index, Number of Floors, Parking etc are codified and stored in Central Database-Oracle Spatial 12c. Building Codes are continuously evolving and storage in a Central Database benefits Architects as they can check for compliance of Building Rules using free service on the cloud and make revisions in Desktop Revit and repeat this process till all the deviations are resolved. 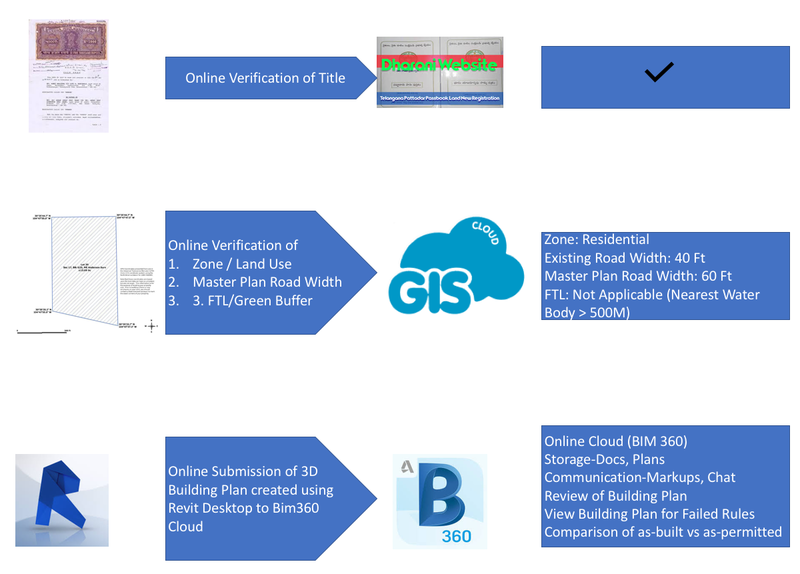 IBIM-APR Web Service continuously monitors for newly submitted Building Permit Applications along with Revit 3D Building Plan and applies Building Rules automatically. 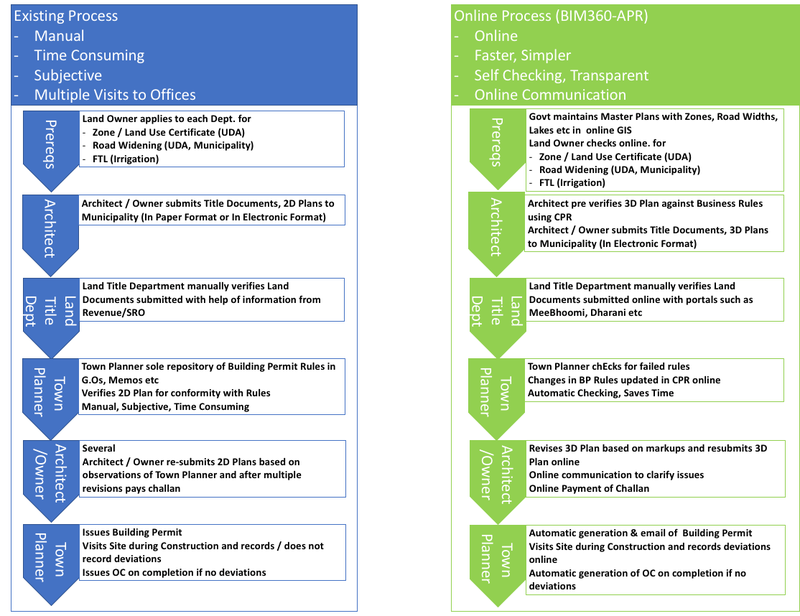 Town Planners, Architects, Owners can raise issues in IBIM-APR and resolve them through online communication such as Markups thereby avoiding need to visit Municipal Office physically and save precious time for everyone. More Importantly all communication is documented. IBIM-APR will generate Online Challan specifying fee to be paid with a link to Online Payment and once payment is made, Building Permit is generated Online and emailed to Architect, Owner. Town Planners can also use IBIM-APR on field using Tablets for Compliance by comparing as-built with as-permitted drawings.